Keep your plant safe, clean and efficient with Hapman dust control solutions. 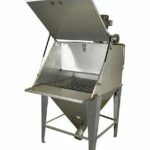 Our manual bag dump stations allow for effective emptying of small volume bags of bulk solids or powder while mitigating loss of product through dusting. Our bag dump stations with the integral dust collection system reduce material waste and eliminate the need to continually clean or have a remote dust collection location. 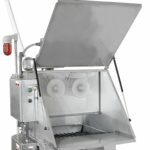 Through the use of the different models of dust Hoods, the Hapman Bag dump Station is designed to keep your material in the hopper and your facility clean. Easy filter access and removal as well as complete access to all components, makes the Hapman Bag dump Stations easy to clean. Other than filter replacement as needed, the Hapman Bag Dump Stations require minimal maintenance to provide you with top performance. The Hapman Bag Dump Stations are designed for the proper handling of food products and can be provided to be fully FDA compliant. 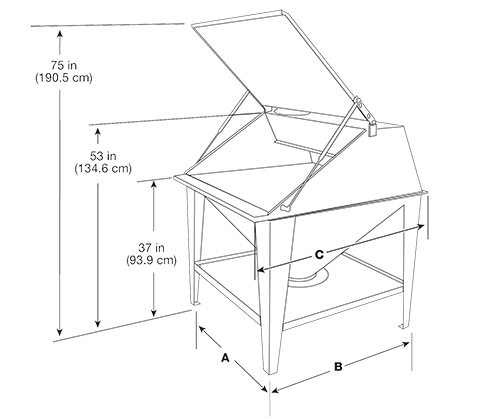 Dust is naturally generated when material is emptied into the collection hopper from bags, boxes, drums, and other containers. 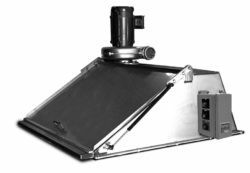 Effective dust collection protects against creating explosive environments, improves plant air quality by reducing contamination, and captures all product for use in your process. Any of our complete bag dump stations with integral dust collectors will optimize your small batch material handling process. April 14, 2016 – Investigators said dust from a broken hose was likely the cause of a dust explosion at an International Paper cardboard box manufacturing plant in Richmond, MS, the Jackson [MS] Clarion-Ledger reported. No injuries occurred as a result of the explosion. Small “spot fires” were extinguished by firefighters after the blast. Read the full story on Powder & Bulk Solids. Operation of Hapman bag dump stations begins with opening the hopper lid. The gas cylinders will allow the heavy-duty door to lift with ease and firmly maintain an open position. While material is dumped through the hopper screen, the airborne particles are drawn into the dust collection filters. Adding a reverse-pulse filter cleaning system to any of our bag dump stations will further reduce material waste. The timer-activated solenoid valves release short blasts of compressed plant air inside the cartridge filter. This causes the dust build-up on the filter surface to fall into the hopper. The two filters are alternately blasted at timed intervals, providing an automated maintenance operation. The combination of our bag dump stations with integral dust collection systems helps to reduce industrial safety hazards, improve plant air quality, and increase dust control for less material waste. 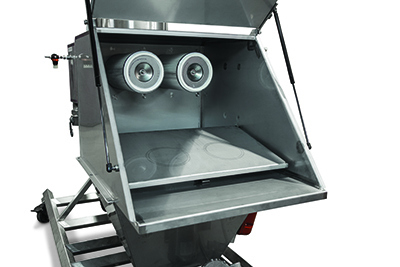 Hood configuration for dust control – External collection or self-contained collection using a centrifugal blower. 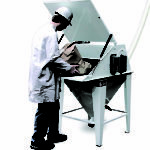 Maximize station operation with an integral bag compactor – Allows empty bags to be easily maintained and disposed. 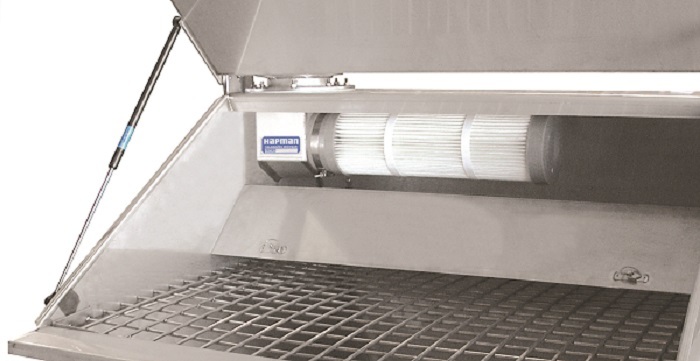 Capitalize on bulk material purchases – With an automatic, alternating, reverse pulse-jet filter cleaning system. Part of a comprehensive material handling system – Our bag dump stations will integrate with conveyors, mixers and other equipment. Integrated controls – Pre-wired controls complete with push-button power and adjustable pulse control timer. Change the washable filter cartridge in minutes. Dump materials easily while gas cylinders support the hood door. Clean the filter automatically with the reverse pulse-jet system. Fit the equipment into most processes with 30 in (76.2 cm), 36 in (96.4 cm) and 42 in (106.7 cm) sizes. Increase efficiency and improve plant air quality and cleanliness. Designed specifically for high volume, multiple material change applications. The filters are 99.99% efficient down to 0.5 microns and can be easily accessed for service. They can be clamped right onto your existing equipment, hoppers or Hapman-provided conveyors. Automatic alternating, reverse-air pulse filter cleaning. Prevent hazardous airborne particles from endangering employees and compromising plant air quality. Our custom engineered Glove Box Series Bag Dump Stations limit employee exposure to airborne particulate when opening and emptying bags. The self-contained air filtration system is 99.9% efficient down to 1 micron, providing complete control over the emptying process. These bag dump stations are easy to use and fit in tight spaces with a low-profile design. Pre-wired NEMA 4X operator station complete with push buttons and adjustable pulse control timer (motor starter is optional). 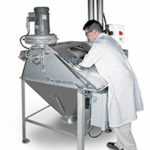 Successful conveying and handling of dry ingredients requires much more input than understanding a material’s properties, the desired convey rate, and distance. Dust control is a constant challenge for any processor that handles dry bulk material. The hazards from dust span the health and safety spectrum from mildly irritating and unclean, to hazardous to health and explosive. Blower motor specifications: 230/460-volt, 3-phase, 60 Hz. Available in aluminum or stainless steel. Explosion-proof or washdown options available. Do You Have Bag Dump Station Questions?